Here's another recipe for you thanks to my sister, Melissa. She made a batch and brought it to my parents' house last time we were together. The recipe is so easy, and only has 5 ingredients. It comes from Claire Robinson. She has/had (not sure if it still airs) a show called 5 Ingredient Fix on the Food Network. You can get the entire (all 5 ingredients) recipe by clicking here. I have used honey in place of the agave nectar (both are great! ), and I've never put the pepper in (I actually never really noticed it calls for pepper). 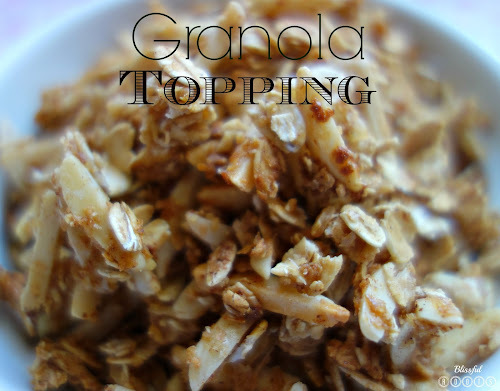 We love putting this on top of vanilla yogurt with fresh or dried fruit. It's also great to eat by the handful as a healthy snack. And if you like granola, you most definitely need to check out this quinoa-pumpkin seed granola recipe. It's another household favorite of ours!